Oh this book. This was one of those books that I didn't want to read too fast because I was in love with the entire thing (setting, characters, plot) but at the same time wanted to know how it ended. 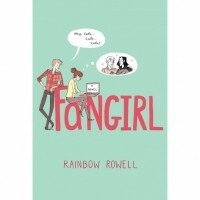 I want to find Rainbow Rowell and live inside her wonderful brain for a while just to get more Levi and Cath and Reagan. It's one of those books where I demand to know what happens next while at the same time thinking that I don't want to know because well, because of something she says in the book. No spoilers here. Plus, Levi may be the ultimate book boyfriend for me.